I'm a little bit behind on Tot School posts. Thanksgiving week and traveling for the duration of it threw us for a little bit of a loop. This post contains our week of Tot School during Thanksgiving week. Once we got back into town, we kind of took the week off of Tot School to regroup and things start back up this Monday morning! Thanks in part to the stress of traveling and just generally being preoccupied by the holidays, it seems I've forgotten to get any pictures of Ethan actually doing Tot School. This was our last week of general colors before moving into themes and it was an interesting week at that! 1. Sorting and Matching - I was sure Ethan would be indifferent about this one, but he actually liked it the most. 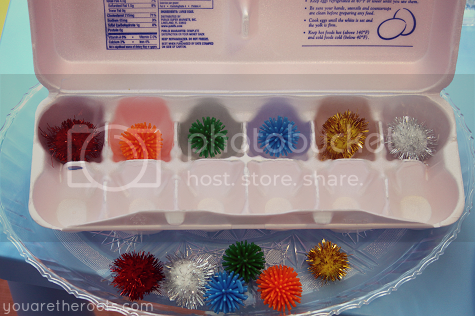 I took an egg carton and placed a pom pom inside each well, leaving extras of identical pom-poms on the tray. Ethan's job was to match up the pom-poms by placing the similar colored one across from the other. He was pretty good at this one and he really, really enjoyed sorting the pom-poms into the wells. As usual, he got red and orange confused a few times but I was really proud at how well he could select the like colors and match them accordingly. 2. Pouch Tops - This was a repeat from earlier weeks and one that Ethan never fails to love. 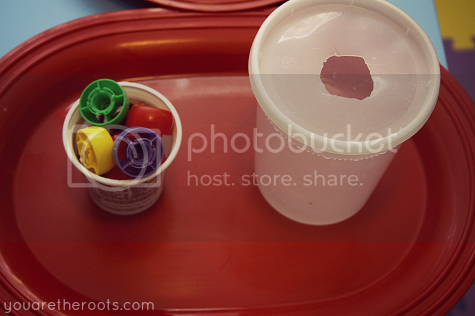 He takes the multi-colored pouch tops from an old yogurt container and pops them into the old deli soup container. He likes to get experimental by putting the pouches in upside down or on their sides. 3. Color Matching - This was a fun one. Ethan had been increasingly interested in the Velcro on our weather wall so I thought it would be fun to incorporate Velcro into one of our activities, too. I made this one by taking some free paint swatches from Wal-Mart and cutting out the different squares. 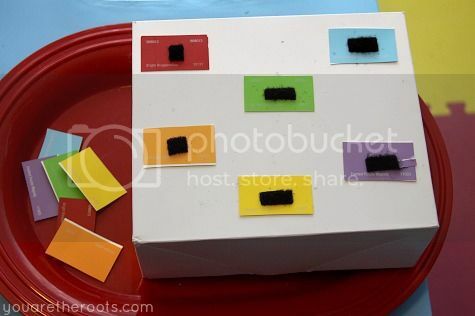 I glued each square onto a gift box and attached a piece of Velcro. Ethan's goal was to attach the like colors to the ones on the box. He was pretty good at this one, too, though he'd do it seriously once and then just enjoy sticking and re-sticking the Velcro shapes. He'd get orange and yellow mixed up a few times on this activity as well. Orange is a tricky color! Magnetic Fishing - I was SO EXCITED for Ethan to see this activity -- that I spent a ton of time on -- but he was really uninterested in it. His favorite part about it was playing with the fish on their own or twirling the rods around in the air. I made this one by painting popsicle sticks and hot gluing an old piece of shoelace as the line to each one. I found the little wooden "bobbers" at Michael's for a couple of dollars and painted each one accordingly, too. 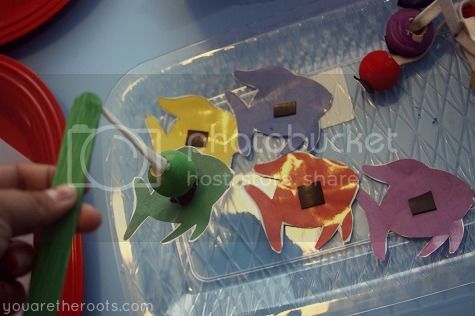 I printed the fish out and laminated them, attaching magnets from a magnetic tape roll accordingly. The idea was for Ethan to fish for the fish of the matching color. Once I showed him how it worked, he thought the concept was cool and tried to pick up a fish or two, but decided it was much cooler to just twirl the rods around. This one will make a grand reappearance in a couple of weeks! I'm totally disappointed but we didn't do any art projects this week. 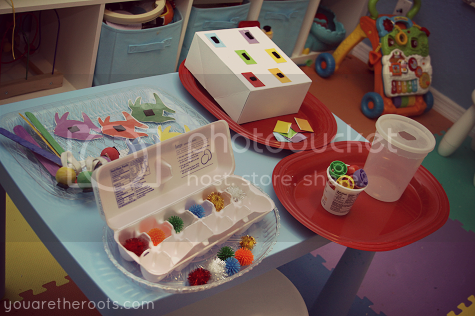 We did, however, do a fun activity with colored ice. 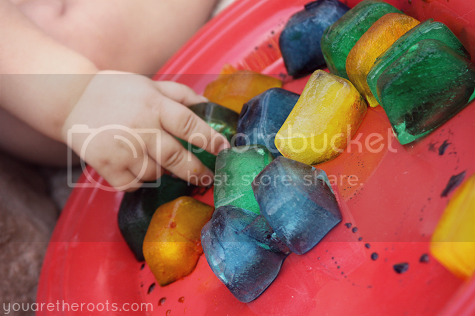 I had simply used food coloring to make some multi-colored ice, put them onto a tray and let Ethan go nuts. I thought playing with something cold would be really fun for him. He loved playing with the cold ice but wasn't so sure about the colors that ran off onto his hands. (He's not a huge fan of getting his hands dirty.) He enjoyed sorting the colored ice from the tray into a nearby plastic bowl I'd left outside previously from another project. These are all great ideas. And your execution of them is beautiful! 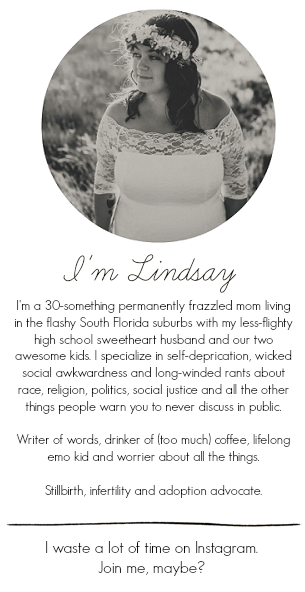 I look forward to the upcoming toddler years! Haha, that's exactly what it is! They're so funny!